The MMP-2 Enzyme-Linked Immunosorbent Assay (ELISA) kit (ab213910) is designed for the quantitative measurement of MMP-2 in cell culture supernatants, serum and plasma (heparin). The ELISA kit is based on standard sandwich enzyme-linked immune-sorbent assay technology. A monoclonal antibody from mouse specific for MMP-2 has been pre-coated onto 96-well plates. Standards and test samples are added to the wells; a biotinylated detection polyclonal antibody from goat specific for MMP-2 is added subsequently and then followed by washing with PBS or TBS buffer. Avidin-Biotin-Peroxidase Complex is added and unbound conjugates are washed away with PBS or TBS buffer. 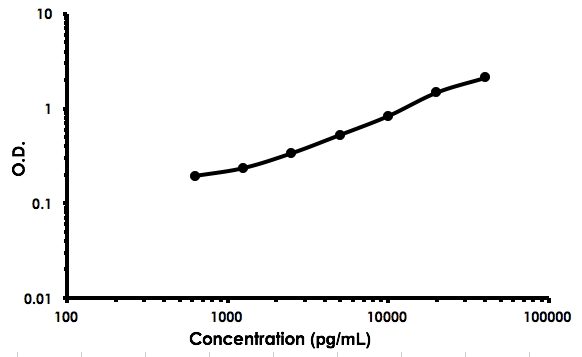 HRP substrate TMB is used to visualize HRP enzymatic reaction. TMB is catalyzed by HRP to produce a blue color product that changed into yellow after adding acidic stop solution. The density of yellow is proportional to the MMP-2 amount of sample captured in plate. The detected MMP-2 includes zymogen and active enzyme. Type IV collagenase, 72-kD, is officially designated matrix metalloproteinase-2 (MMP2). It is also known as gelatinase, 72-kD. MMP-2 plays an essential role in angiogenesis and arteriogenesis, two processes critical to restoration of tissue perfusion after ischemia. MMP-2 expression is increased in tissue ischemia, but the responsible mechanisms remain unknown. Matrix metalloproteinases (MMPs) catalyze extracellular matrix degradation. Control of their activity is a promising target for therapy of diseases characterized by abnormal connective tissue turnover. MMPs are expressed as latent proenzymes that are activated by proteolytic cleavage that triggers a conformational change in the propeptide (cysteine switch). The structure of proMMP-2 reveals how the propeptide shields the catalytic cleft and that the cysteine switch may operate through cleavage of loops essential for propeptide stability. The gene is localized to 16q21 using somatic cell hybrids and in situ hybridization. Our Abpromise guarantee covers the use of ab213910 in the following tested applications. ab213910 has not yet been referenced specifically in any publications. Publishing research using ab213910? Please let us know so that we can cite the reference in this datasheet. There are currently no Customer reviews or Questions for ab213910.